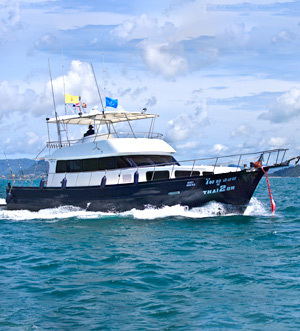 Fishing in Phuket is a full-fledged marine adventure that will be a mandatory thing in the program of your next holiday. Thousands of tourists in Thailand go to the sea for fishing annually. They hunt their trophies for several hours and after they fished it out, they are thrilled to pieces. All this is due to the fact that fishing here is not just entertainment, but a whole ritual. — is a fishing with a special spinning tackle and reels for the trolling. There can be different kinds of tuna, barracuda, dorado, mackerel, sailfish in your catch. The boat is equipped with global positioning system (GPS) will help you with the search for fish places. — is the way to catch fish from the shipboard when your boat is anchored, buoyed or in drift. This is the way a grouper and white snapper is caught. 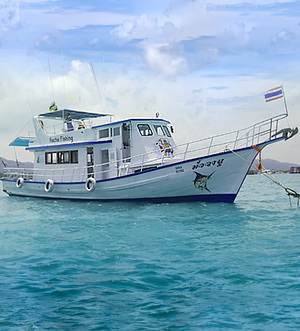 The crew of Thai-Charters company knows the best places for bottom fishing and will certainly take you there. In addition to fishing, we suggest you try yourself in underwater hunting! Upon the request we provide you with equipment for underwater hunting and, if necessary, we will train you this craft. You will definitely enjoy it! After your sea adventure, we will organize for your clique a private barbecue on the shore of the island cooking the fish you caught. 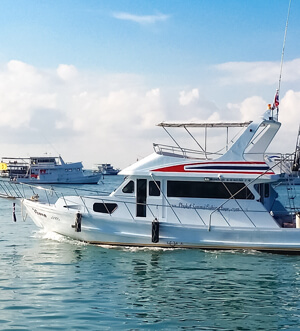 What’s special about fishing with Thai-Charters company? First, we will choose a suitable boat for you depending on the number of people, the budget, and other wishes. It’s up to you whether it would be a speedboat, a spacious fishing boat for professional fishing in the sea or a motor yacht! Having an ability to choose is a great option. Our goal is to make you feel the pleasure from fishing. We will choose a route depending on your wishes whether you want to devote the whole day for fishing or fishing on the way to a colorful island. You choose. If necessary, our experienced fishermen will advise you and help you during the voyage. Leave your phone number or e-mail and our manager will contact you. Then you will choose the most optimal option for an unforgettable holiday.